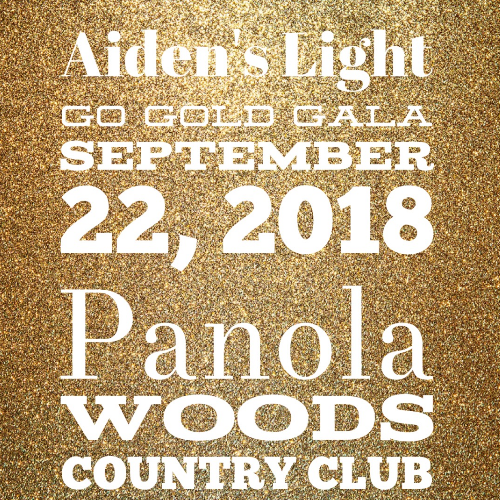 The Go Gold Gala is in honor of September being recognized as Childhood Cancer Awareness Month. We are choosing to Go Gold to raise money to assist families financially whose child has been diagnosed with DIPG (Diffuse Intrinsic Pontine Glioma)...a terminal brain-stem tumor and one of the deadliest forms of Childhood Cancer. The Go Gold Gala is a formal/semi formal event in which we will showcase our foundation by educating attendees on our mission and raising awareness about DIPG. September is Childhood Cancer Awareness month and the Gold ribbon represents the term "Children are more precious than Gold"...we are choosing to take action and raise money for our foundation, Aiden's Light, to help families financially whose child has been diagnosed with DIPG. DIPG is one of the deadliest forms of childhood cancer! This event will be a night of Live Music, Dancing, Light Finger Foods, Cash Bar, Speakers, Silent Auction, Socializing all while honoring these kids and their families. All proceeds from this event will go to helping families financially whose child is battling DIPG...it may assist them with medical bills, experiemental treatment, travel expenses, costs of daily living and with a terminal diagnosis...funds are often used for funeral costs. Doors will open at 5:30 PM with the welcome and introduction at 6PM. The first band will start close to 6:30 PM. No childcare available. Alcohol will be served. We suggest leaving the little ones at home for the night and come and enjoy a night with your significant other or a group of friends!